Here’s how to redeem McDonald’s deal and enjoy exclusive offers. How To Download McDonald’s® App? How To Register McDonald’s® App? 3 easy steps to register and start redeeming exclusive offers. How To Redeem Your Exclusive Offers using McDonald’s® App? STEP 4 – Redeem your offer instantly! Note: To redeem an offer, simply activate it in an area with a connection. You’re not allowed to use 2 offers in the same transaction. You are only able to use 1 offer per basket. Download McDonald’s app now and start redeeming the exclusive offers like a VIP every day. 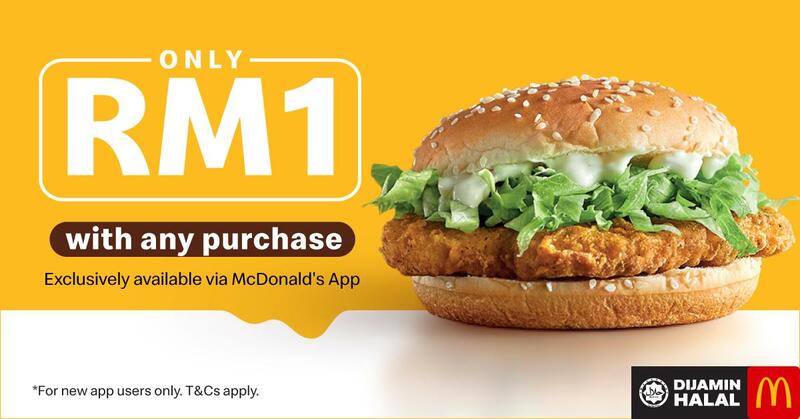 In case you didn’t know, there is also an exclusive welcome offer in the app that lets you purchase a McChicken for ONLY RM1 (with any purchase) when you download & register the McD app! This welcome promotion is limit to one-time redemption for new app users only. Disclaimer: Information correct at the time of publication, changes in circumstances and/or changes made by the source and brand after the time of publication may impact on the accuracy of this information.